Owl Commander was designed to be a file manager for Windows similar to the Windows file manager WINFILE.EXE. It's easy-to-use and powerful application designed for users of all levels, from new users, feel themselves non-comfortable with Windows Explorer, and to experienced users who need a powerful file manager, affording all means necessary. Dozens, if not hundreds, file managers for various operating systems repeat all the same old approach to the file manager-2 panel, command line and it is all. We obviously do not want to limit you-exactly well, as to your desktop you put all your documents and books, with Owl Commander you open the requisite number of panels and have them in your order. This is not the end-wages that you have four tables simultaneously, and you can freely switch between them depending on what you need at the moment! That is the paradigm of four desks (desktop's), initiated by Owl Commander. Well...The book can be closed and put on the shelf, the folder can be hided ... Well, if you want your entire desktop with folders, books and papers in a week or a year? · Multi panel & multi desktop file manager. · The modern interface helps you to have full control over your files and folders. You can immediately begin using Owl Commander, with no learning curve, because it will feel extremely familiar and comfortable to you. · Fully Configurable Menus, Toolbars and Hotkeys. Support drag&drop, right-click context menus, and clipboard operations with files. · You not need external ZIP and FTP programs - Owl Commander lets you access ZIP files and FTP sites as easily as local folders! You can copy files from anywhere and to anywhere - even from an FTP site straight into a ZIP file! · Very fast file and directory search, Search by file context. search in ZIP files. You cannot download any crack or serial number for Owl Commander on this page. Every software that you are able to download on our site is legal. There is no crack, serial number, hack or activation key for Owl Commander present here. Our collection also doesn't contain any keygens, because keygen programs are being used in illegal ways which we do not support. All software that you can find here is freely downloadable and legal. Owl Commander installation package is prepared to be downloaded from our fast download servers. It is checked for possible viruses and is proven to be 100% clean and safe. 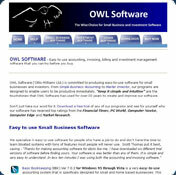 Various leading antiviruses have been used to test Owl Commander, if it contains any viruses. No infections have been found and downloading Owl Commander is completelly problem free because of that reason. Our experts on malware detection tested Owl Commander with various spyware and malware detection programs, including fyxm.net custom malware and spyware detection, and absolutelly no malware or spyware was found in Owl Commander. All software that you can find on our servers, including Owl Commander, is either freeware, shareware or open-source, some of the software packages are demo, trial or patch versions and if possible (public domain licence), we also host official full versions of software. Because we want to be one of the fastest download sites on the web, we host all the software including Owl Commander on our servers. You cannot find here any torrents or download links that would lead you to dangerous sites.